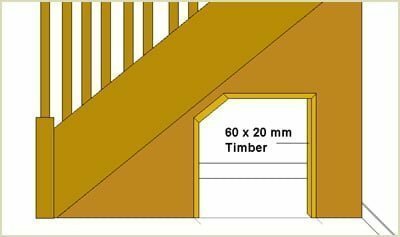 Creating An Under Stairs Cupboard. 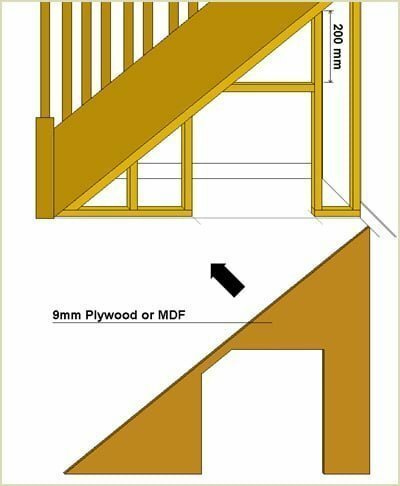 An under stairs cupboard or storage area can easily be created by using MDF or plywood board. 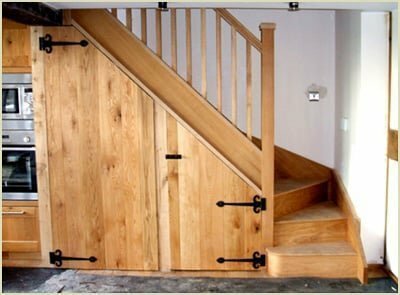 An under stairs storage area is ideal if storage space in your home is at a premium, it can be a relatively complicated undertaking, but get the basics right and everything should go smoothly and you will be left with an under stairs storage cupboard with an attractive look. Firstly, remove any carpeting from the area directly under the staircase revealing the underlying floorboards. 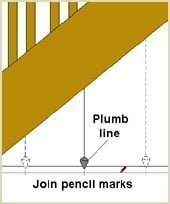 Hold a plumb line bob just below the staircase at several different points and mark on the floorboard with a pencil the following points. 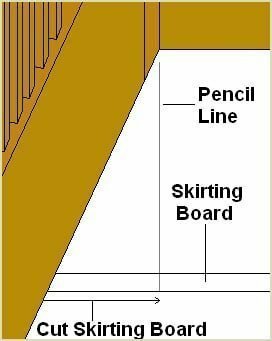 If any skirting board is fitted around the back wall of the staircase, it needs to be removed. At the pencil mark you have just made, cut the skirting board using a fine handsaw and discard this section. 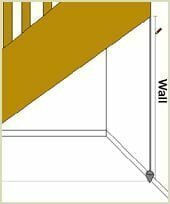 On the pencil line marked on the floor directly underneath the edge of the staircase, decide upon the position of the door to the cupboard. 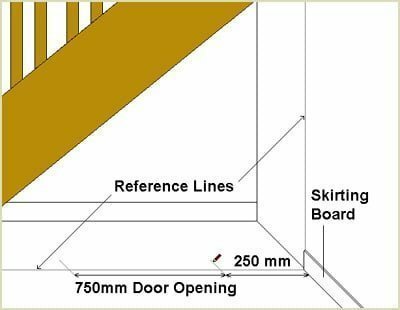 As a general rule, the door width should be no more than 750mm and in a position roughly 250mm from the adjacent wall. Cut from a 50x50mm timber to form the base rail of the frame work. Screw these sections into the floor board along the pencil line, leaving a 9mm gap between the timber and the pencil line. 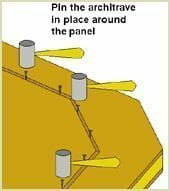 Use a small piece of 9mm plywood as a guide. Make sure you leave a gap for the door opening as shown. Screw another 50x50mm piece of timber into the wall directly underneath the staircase where you made the pencil mark. Again leave a 9mm gap between the pencil mark and the timber. 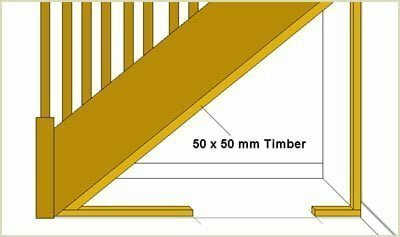 Use a long piece of 50x50mm timber to attach to the underside of the staircase string, again leaving a 9mm gap for the plywood paneling. Put in strengthening columns into the framework as shown below. 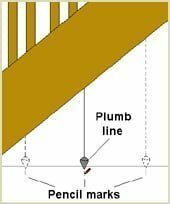 On the final upright, measure 200mm down from below the edge of the staircase string and mark the position on the timber. On this mark, nail in a 50x50mm piece of timber in the horizontal position as shown below. This forms the top piece of the door frame. It is now time to cut the front panel from 9mm plywood or MDF. Measuring around the timber frame and where the door will go, cut the 9mm board using a jigsaw cutter. Plain the rough edges with a planer. Ensure the framework for the door is square as this will make things a lot easier. 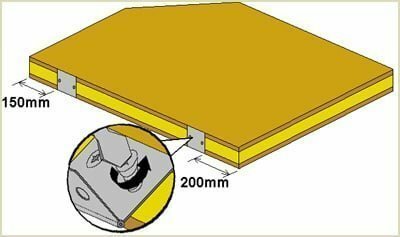 Attach the panel to the framework and secure it using 25mm countersunk screws. Drive the screws below the surface of the board and use wood filler or plugs to disguise the screws. 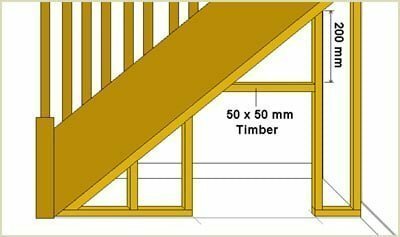 Nail a 60x20mm timber frame around the inside of the door opening to form a frame. Make sure to keep the edge of the door frame flush with the front edge of the plywood board. 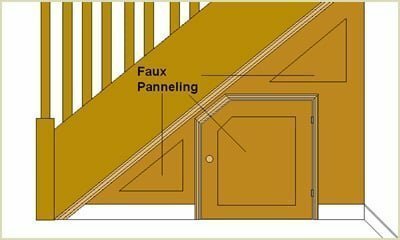 Apply some matching architrave around the edges of the door frame and the edge of the plywood between the string of the staircase. Also, fit matching skirting board around the base of the plywood panel as shown. 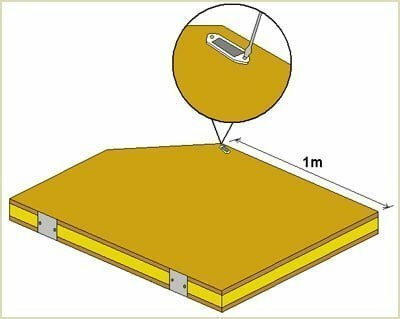 Accurately transfer measurements from the door frame onto a thin piece of plywood or MDF 6mm thick. Use this piece to check against the door opening to check whether it is a correct fit. 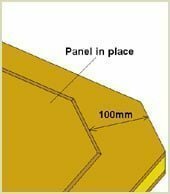 If it is a good fit, use this piece as a template to make another panel of matching dimensions. If not, use a planer to reshape the panel until it fits. Using one of the panels as a guide (A), cut a 25x40mm piece of timber to make the internal framework for the door as shown. Apply adhesive (PVA glue) around the door panel and add the timber frame (B) as shown. Once it is in place, pin the timber sections in place (C) as shown. Apply adhesive over the timber frame and slowly fit over the frame of the other plywood panel. Pin the final panel (D) in place as shown. With the door constructed, it is now time to attach the hinges. Surface mounted hinges are easier to install, but if you want to be adventurous and feel you have the skills, you can embed traditional hinges to the door frame. Position the top hinges 150mm from the top of the door and the lower hinge 200mm up from the bottom of the door, see below. Next, install a magnetic latch to the top quadrant of the inside door. It is recommended that the latch be situated at least 1m above the bottom of the door. To add some decor to what is after all, just a flat panel of plywood, you could add some faux panelling with architrave around the edges. This gives the effect of fielded panels. Start by cutting some 6mm plywood or MDF about 100mm smaller all round than the overall size of the door. 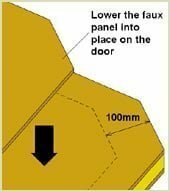 Apply some glue to the back of the panel and place it on the door 100mm in from the edge of the door. Glue and pin some moulding around the panel. Make sure the nails are punched under the edge of the mouldings so that they can be covered by wood filler. If you so desire, you can use the same technique to apply these same faux panels to the rest of the cupboard as shown below. 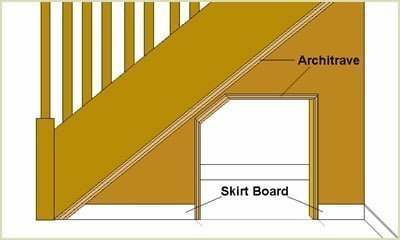 As an alternative design, you could use tongue and groove boarding instead of MDF to match your staircase. Below is an example of one of Pear Stairs customers using Oak tongue and groove boards. Remember if you have any questions don't hesitate to phone us about your staircase finish. We are a friendly company phone Pear Stairs on 01938 553311.